Manchester - Manchester City manager Pep Guardiola admits his high-flying side will suffer a blip at some point but is optimistic they will react better than they did last season. Guardiola's team have been in imperious form so far this season and are unbeaten in all competitions. City top the Premier League table with seven wins out of eight matches, and no other club in over a century has scored more top-flight goals at this stage of the season. They head into their clash with Burnley at the Etihad Stadium on Saturday on the back of a 7-2 league victory over Stoke and a 2-1 win over Napoli in the Champions League. Guardiola was effusive in his praise of those two displays, calling the former the "best performance" of his tenure at City and describing the latter as "perfect". City made an equally eye-catching start to the season a year ago as they chalked up 10 consecutive victories before a dip that saw them lose three and draw three of their next six matches. They were never quite able to recapture their early season form and finished 15 points behind Premier League champions Chelsea in third spot. 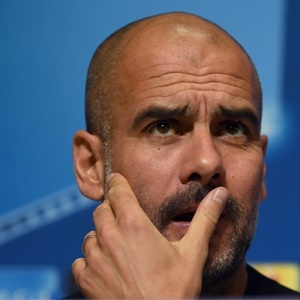 But Guardiola indicated he has seen enough from his players so far this season to suggest a positive reaction when they eventually face a setback. "That blip is going to happen, we are in October. We cannot expect to finish the season like we have done in the last month when we won all the games," he said. "It's impossible in football in the high level but I want to see that, I want to see how we are going to react in that moment we drop points. We will see how strong we are because teams always show in the bad moments." "How you do in the bad moments is important," he added. "That is why I'm optimistic because the way we reacted at 3-2 against Stoke was so good." Guardiola played down the idea that given the youthful vibrancy of his side, they have the potential to dominate English football. Comparisons were made with the all-conquering team he managed at Barcelona, but the Catalan emphasised City had achieved nothing yet. "When you win you have to win the second one, the third one and the fourth one," he said. "And when that happens you can be considered dominant but not one team has won a title in October. There's no sense to talk about that. "We can talk about Chelsea, who dominated last season, they won 13 or 15 games in a row, and how difficult that is to do in this country." Guardiola also hailed the qualities of City centre-back Nicolas Otamendi as a key factor behind his side's start. The Argentine international made a shaky start to his City career after a switch from Valencia in August 2015 but has performed impressively this season. "He has a warrior mentality, yes," Guardiola said. "He is one of the players with the strongest mentality that I met in my life."